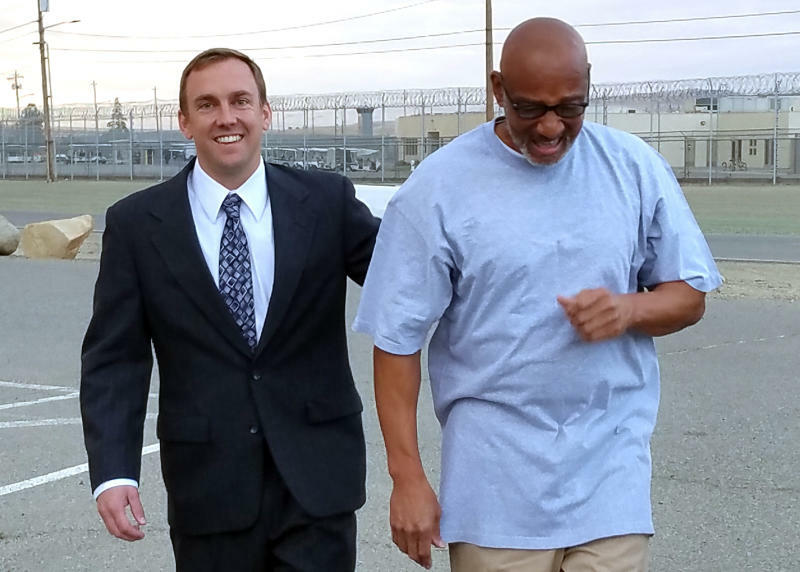 RIVERSIDE, Calif. (AP) — A Southern California man wrongly convicted of murdering his lover two decades ago has been exonerated and new arrests have been made in the case, authorities said Monday. Riverside County District Attorney Mike Hestrin announced the arrests of Googie Harris and Joaquin Leal in the 1998 strangling of Terry Cheek, whose body was found on a lake shore. Harris was Cheek's husband and Leal is Harris' nephew. Cheek's lover, Horace Roberts, was declared innocent and released from prison on Oct. 3. He was reunited with family in South Carolina, according to the California Innocence Project. 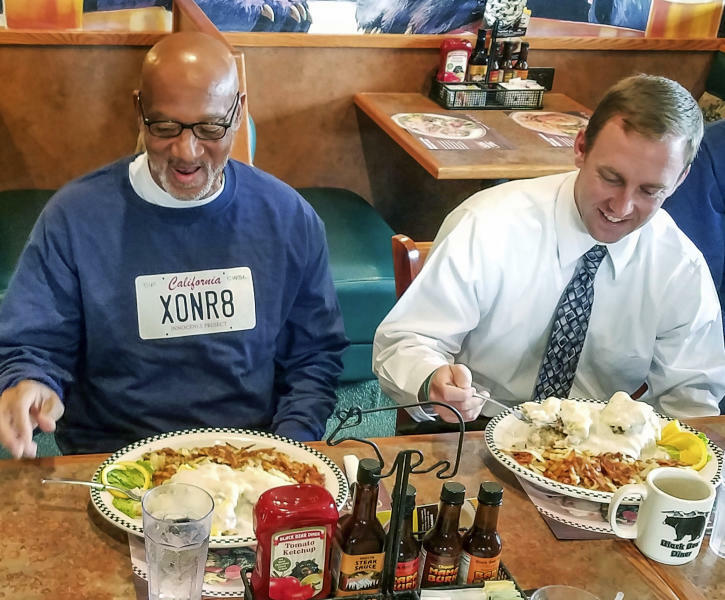 The nonprofit took up his case in 2003 and hailed the exoneration as justice served. 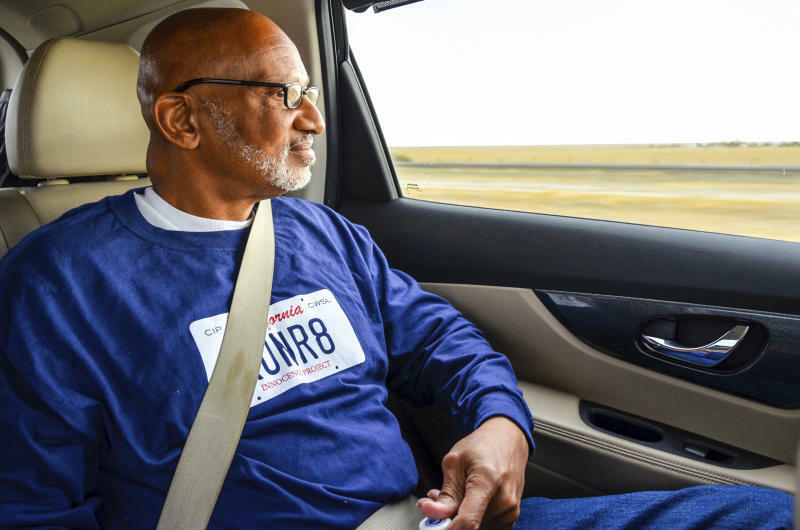 The California Innocence Project posted a video showing Roberts, 60, tossing his prison clothes into a trash can after more than 20 years and savoring a Pepsi in the back seat of his attorney's car. "This is what I missed more than anything — my freedom," Roberts said with a smile. Harris and Leal were arrested Friday after new DNA tests connected them to the crime, Hestrin said. They're being held in lieu of $1 million bail and were expected to appear in court Tuesday. It wasn't immediately known if they have attorneys who could comment for them. "Googie Harris set Roberts up," the California Innocence Project's Justin Brooks said in a statement. "It's the oldest story there is in the murder business. Husband kills wife who is cheating on him. The twist in this case is that the husband then set up the lover to go to prison for the rest of his life." In 2017, crime scene evidence was sent to the California Department of Justice laboratory in Riverside. DNA on a watch found with Cheek's body was matched to Leal in March, prosecutors said, and he and Harris became the focus of a new probe. "What happened to Mr. Roberts is tragic," Hestrin said. "We as prosecutors always strive to be vigilant and follow the truth. Once I learned of the new DNA findings, I immediately directed that all charges be dismissed. Mr. Roberts has my commitment that we will aggressively apply new technologies to past, present and future prosecutions."